All photos by Rickard V.
Slotcity Västerås hosted the fifth round of the Sveslot Salooncup and the wing-cup during the 5-6 November. Saturday started with the Production 1:24 class with 29 entries. Early qualifier Michael Landrud turned an impressive 4,163 lap. He was later beaten by two juniors. In second place Mikael Palmqvist 4,141 and in third place Robin Lundmark 4,160. Finally one of the seniors put the booth down and showed these young brats. Torgny Nordgren with a 3,979 lap. 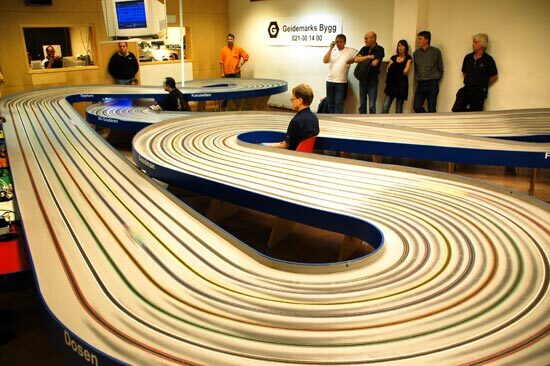 After the semi-finals the field of drivers were separated into two main finals. One for junior drivers and one for senior drivers. Production main junior. From left to right: Carolin Karlsson, Daniel Ax, Erik Jonsson, Christoffer Karlsson, Fredrik Hedberg, Marcus Vandersson, Robin Lundmark (driving), Mikael Palmqvist. Mikael Palmqvist took an early lead closely followed by Robin Lundmark. These two drivers separated themselves from the rest of the field. 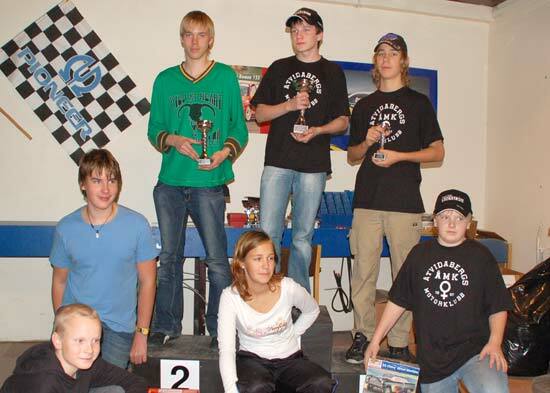 When the main was over Mikael Palmqvist had won yet another junior main. Robin Lundmark in second and Christoffer Karlsson in third. Michael Landrud was an early pace setter but crashed into problems already in the first heat. Lasse Åberg took the lead after the first heat. In the second heat Michel Lorin went into the lead together with Lasse. Third heat saw four drivers close together. Michel in the lead 113 laps with Ove Halvarsson, Lasse and Lars Harrysson on 112 laps. In the fifth heat Lasse took over the lead and held on to it until the end. 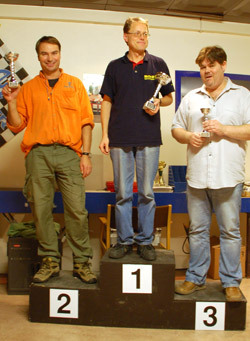 Michel looked certain to grab second place, and did, despite Ove Halvarsson driving three really good heats at the end.